Split students up into groups. 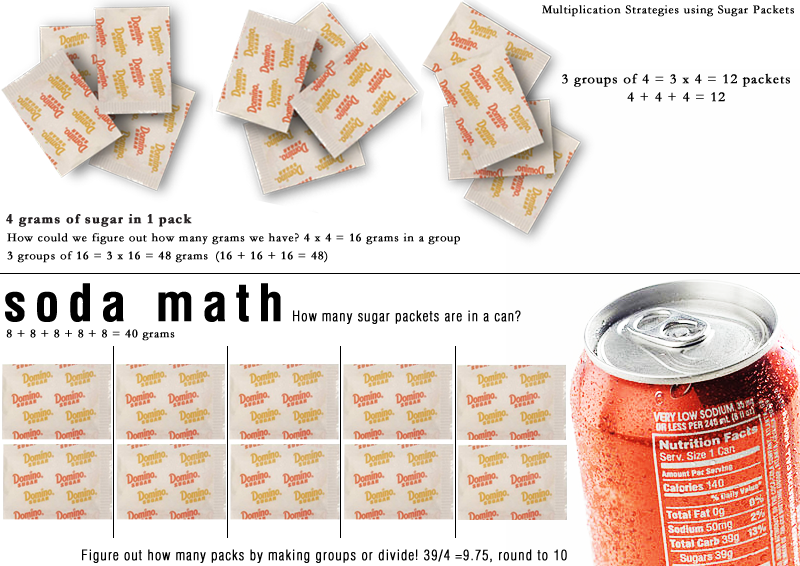 Give each group some sugar packets to experiment with multiplication strategies. How many packs do they have? Tell them that each pack has 4 grams of sugar. How can they figure out how many grams of sugar they have? Once they have figured it out, give each group a different can of soda. Can they figure out how many packs are in their can of soda? First, have them estimate! Then, they solve! They could use their multiplication strategies. More advanced students might figure out that they can get their answer faster by dividing. Students collaborate and problem solve to get the solution! Was their estimated number close to the final result? Check out Dan Meyers' 3 Acts for videos to go along with this lesson!